For those of you who missed the last offer for the 2018 edition, here's one for BD 2019. 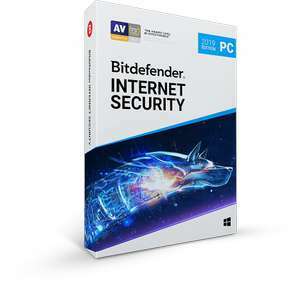 Bitdefender® Internet Security 2019 awarded “Product of the Year” by AV-Comparatives. This subscription covers up to 3 devices. I stuck with kaspersky after the stories of links to the Kremlin but BD has been hammering kaspersky for some time so I decide to change even though I have 6 months on my existing kaspersky license. The unlimited device Family edition swung it for me. That's because some countries didn't like what Kaspersky found out. State sponsored virus like Stuxnet. Is Bitdefender for protecting my bitcoins? No, it’s protecting your......... bits ! Great! Just what I was after! Bitdefender came out top in the recent Which? tests. Kaspersky didn't. Which? particularly praised Bitdefender's defence against ransom ware. I just grabbed what was on the webpage, but like I said, can you show us all some tests results that back-up your statement? I don't have an axe to grind as I stuck with Kaspersky for a long time and I would happily switch back (or to a different product) if Bitdefender stopped coming out on top. I switched from Kaspersky to Bitdefender when Barclays stopped giving it away free due to the potential security issues with Kaspersky. Not had any problems with Bitdefender and glad I chose it at the time out of all those available. I just looked at the test report on AVTest, the reason why AVG is "in the top 3" is because the list is sorted alphabetically, so it is 3rd after Ahnlab and Avast - you should really take time to read and understand things before firing off misleading statements. If you sort on performance you will find that there are 13 products ranked higher than AVG! In the interests of fairness, there are 3 products that score perfect 6's, Kaspersky, McAfee and Avira - BD scores slightly lower as they have dropped 0.5 on Useability but that's subjective I guess as I find sllicker to use. Do you have to give any financial details for them to charge when the 6 months run out? Tried to migrate to this and had no security cover as it wouldnt work. "Customer service" was an oxymoron - so voting icy. Bitdefender support and renewal practices are a joke. I prefer Kasperksy as well - it jus works and works well - and I've probably tried all the AVs at some point or another. I prefer Kasperksy as well - it jus works and works well - and I've …I prefer Kasperksy as well - it jus works and works well - and I've probably tried all the AVs at some point or another. Try Kaspersky Free. Doesn't have all the bells and whistles of Kaspersky Pure but it still uses the same AV engine. Norton's source code got leaked in 2012 so I don't think that's safe. Said that to me as well but I installed anyway. I haven't noticed any slowdown and my cpu is way below 1500MHZ. Better not let Symantec hear any of that?. What, with allllllll the money they invested in Peter Norton almost 20 Year's back?. I used to initially like the Norton AV + the Norton Internet Security stuff's too ... (after Norton AV somehow was able top the Dr Solomon brand of AV + Security product's that came wayyyyyy before it?!. (Only to later then learn that a then relatively still yet unknown at the time AV Company in the form of McAfee had come out of nowhere with some serious fund's and bought Dr Solomon out). "I only once in my life purchased antivirus software for real money". Which one/one's did you formally use that you rather found useful, and/or sufficiently better or superior instead, etc, etc, etc?, thanx. Sorry to hear, and fair enough ..."I only once in my life purchased …Sorry to hear, and fair enough ..."I only once in my life purchased antivirus software for real money".I take it that you were formally pretty much only rocking free AV Software then?, or ...Which one/one's did you formally use that you rather found useful, and/or sufficiently better or superior instead, etc, etc, etc?, thanx. I used NOD a few years, AVG I used for the last 8 years probably until they merged to avast and now they are realy bad. I had to reinstall windows 2 times on my missus laptop after wi fi issues which I wasn't able to sort out after many many hours . Perfect timing. Big thanks OP.